What’s Wrong With Patrick Sharp? Patrick Sharp shot the lights out last season and this season cannot seem to buy a goal. Many have bemoaned his production this season blaming his lack of points up on anything from aging, being overrated or just suddenly forgetting how to play hockey. None of these theories has been backed by any sort of data, so what’s really wrong with Patrick Sharp? Assuming he’s not paying the back end of a deal with the devil for his spot on the Canadian Olympic team last season, nothing is actually wrong with Patrick Sharp aside from some bad luck. Players go through slumps where things just don’t go right for them. It happens in baseball. It happens in hockey. It happens in virtually every sport. 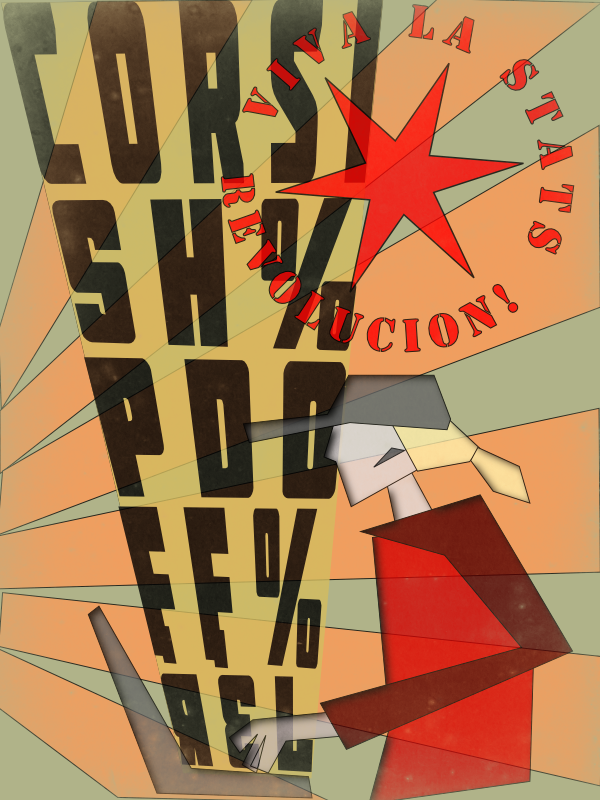 Sharp is in a slump and having some bad luck, but don’t just take my word for it. Let’s look at the numbers. Every season when the annual awards are being voted upon, big debates spring up about who should win what, usually with a big dose of homerism to go along with it. In the past, I would really get into those, but over the last few seasons I’ve come to find them to be more of an annoyance than anything. The awards themselves are not really the annoyance actually, it’s more the sometimes ridiculous levels the debates around them reach and the fact that so often, the voters seem in large part to do their voting based upon reputation or trendy picks more than anything else. Recently, I was discussing some of the flaws in the breakout system (defensive zone exits) the Montreal Canadiens use with Mathieu Roy (@Le_Matheux on Twitter) and he told me that Habs’ coach Michel Therrien was getting some mention as a potential Jack Adams Award nominee. This led us into a discussion of how misguided we thought the voting for that award was and spurred me to do a little more digging. Building off of my previous piece on the realities facing the Chicago Blackhawks due to the salary cap, I questioned the willingness of Head Coach Joel Quenneville to develop young players on the NHL roster given that he has not really had to do that very often during his time in Chicago. In the past when I have pointed out Quenneville’s hesitance to let younger players learn, people have often given a few examples of young players making the team to refute my claims. This spurred me to look through the past several years of player usage and movement to see if I was simply being too hard on him. 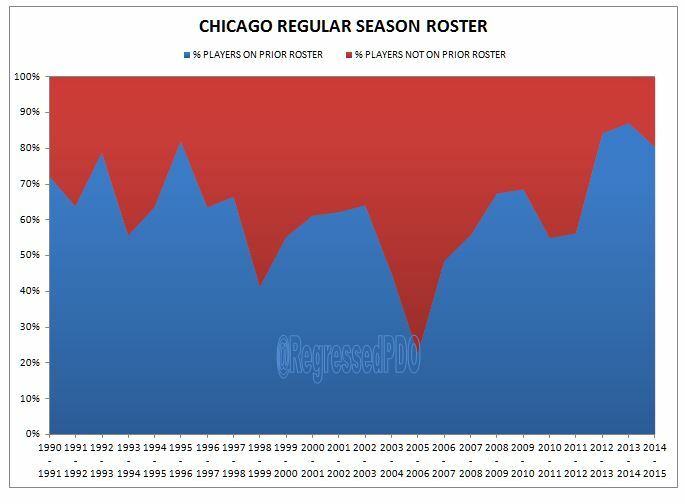 The graph above shows the percentage of players on the Chicago roster during the regular season who were regulars on the roster the season prior. In determining this, I considered any skater with at least 20 games played during the season, excluding playoffs, as a regular roster player. They goalies were determined on a case by case basis since often goalies are called up to fill in sporadically, but they are not usually considered as part of the roster at the end of the season. Those skaters with under 20 games played or who were acquired in the offseason were obviously not part of the roster the prior season for my purposes here. Stan Bowman took the reins as GM of the Chicago Blackhawks from Dale Tallon back in July of 2009. The team that Tallon had partially built went on to win the Stanley Cup that season. Due to the salary cap, many pieces of that team had to be traded the following summer. The supporting cast of the team was rebuilt and in the 2012-13 season won the Stanley Cup again. Last season the team lost in overtime of Game 7 of the Western Conference Final. This season, despite being in a playoff position with just under 20 games left, the Blackhawks have been struggling a bit to play a complete game. Many rumors were swirling about trades prior to the deadline. On February 27th, Chicago traded picks for defenseman Kimmo Timonen of the Philadelphia Flyers. Chicago then acquired forward Antoine Vermette from the Arizona Coyotes for AHL defenseman Klas Dahlbeck and Chicago’s 2015 first round draft pick. Finally, on deadline day, Ben Smith was traded to the San Jose Sharks for Andrew Desjardins. Throughout his 5 and ½ years as the GM of the Blackhawks, Stan Bowman has met with considerable criticism of his moves, some of which is likely due to the loyalty some feel for Dale Tallon. Others like the moves Bowman has made, particularly in drafting players. Right now, after the focus on the upcoming playoffs, the biggest issue on the minds of many comes from the development and usage of the players in the system. With the team right up against the salary cap and the uncertainty of how much the cap will move, many believe that using the players already under contract in the system is more efficient than bringing in more seasoned players and will be necessary to the continued success of the team. This idea has merit of course, but the big stumbling block is whether the younger players, if brought up to the team, will even be played. Head Coach Joel Quenneville has gained a reputation for being a very good coach, but also one who often balks at the idea of using young unproven players. This is fairly common in coaching at the NHL level, but with Quenneville, many see it as a refusal to allow young players to make mistakes and learn from them. From the outside, Quenneville seems like a coach who wants players on his team to be polished professionals upon arrival, regardless of where they are coming from and when you add in the salary cap struggles of the team, it may lead to frustrating results. Put bluntly, Quenneville is a terrific NHL coach, but if the team needs to work in players who are not experienced pros due to salary cap issues, there are going to be problems. If Quenneville is not willing to adapt his methods to accommodate the realities of the business end of the team, I don’t see how the partnership can last much longer than next season. I embrace the “win now” temperament just like many others so I understand the moves that were made on the trade market, but looking long term, which is what the GM of the team must do, the realities of the money part of this business may make it necessary for a coaching change in the near future. Let me once again stress that Joel Quenneville is an excellent hockey coach. His systems are, quite frankly, revolutionary in terms of modern hockey strategy. Quenneville has developed a three scoring line and one checking line approach to player usage that allows his teams to optimize their offensive talent while suppressing their opponent’s offense. It really is extraordinary and so it is with much difficulty that I would even think that Chicago may have to head in a different direction soon and really that thought is only driven by the constraints of the salary cap. If Quenneville cannot be given the team he wants, he has yet to show much willingness to take a chance on a young player with a learning curve to fill the roles the salary cap will not allow to be filled with a veteran player. There are several factors that complicate this matter. First, the Blackhawks have had great success over the past several seasons including two Stanley Cups. Second, replacing Quenneville would only be an option if a coach with similar progressive strategies but who is open to allowing younger players to develop is available or attainable. Third, because the roster is packed with talent, short term results (i.e. going deep into the playoffs again this season) would have to be ignored with the goal being long term sustainable success. If hockey was purely business driven, this would be easier to accomplish; however, there is a heavy dose of public relations and personal loyalty to consider with every move. All of these factors will likely lead to Quenneville finishing out his contract with Chicago and perhaps being given an extension. We’ve seen this happen around the league in the past. Teams enjoy great success and continue forward with the status quo despite knowing (or at least being in a position where they should know) that their current approach to team building and player development will cause problems down the road. Essentially, hockey cycles through being a reactive business when the team is successful and a proactive business when the team is struggling. If teams want to sustain long term success in the salary cap era, they must begin to embrace a more proactive farsighted approach even in good times. In Chicago’s case, the star studded roster will eat the majority of the salary cap space over the next several seasons. Young players on cheap contracts will be an absolute necessity if the team wants to develop the depth required for successful season results. As those players get near the end of their cheap contracts, they will have to be moved for assets that will turn into not only the stars of the future, but the depth players too. Quenneville has shown some willingness to give young players a chance at the depth forward positions near the end of the season going into the playoffs. This has almost always happened when an injury late in the season suddenly requires improvisation to fill out the roster. If the player is fortunate enough to avoid many mistakes, he may find himself making the team out of camp the next season or at least being the “go to guy” when injuries the following season require call ups from the AHL. The other recent trend that has allowed young players to see some playing time late in the season is when players like Marcus Kruger and Teuvo Teravainen have finished the season with their European teams and are being brought to North America. College players having finished their NCAA seasons have also gotten a chance for a little playing time such as with Ben Smith, Drew Leblanc, Matt Carey and others. The problem with this end of the season approach is that instead of developing players throughout the regular season, Chicago often only gives them a shot during the pressure cooker of the run to the playoffs. Granted, that is still a great opportunity for a young player to get, but every mistake he makes has magnified consequences. If Chicago were more willing to take a chance on a young player earlier in the regular season, they would likely get a far better sense of what the player is truly capable of and allow the player to develop and learn so that when the playoffs do come around, he’s prepared for his role instead of scrambling to be perfect in a new high pressure situation. I am not a hockey coach or an NHL GM. I do not presume to have the knowledge that Quenneville and Bowman possess. I am coming at this from the perspective of an outsider trying to piece together how things will go in the future based upon how they have gone in the past. In my years of reading and studying hockey, I have noticed a common theme in the comments made about great coaches. One of the most hailed attributes of great coaches in any sport is often encapsulated in quotes from former players that boil down to: He let me know that everyone makes mistakes and that the important thing was to learn from them so I could become a better player. Again, as an outsider, it appears that coaching star players and coaching young developing players requires two different approaches. It is not one size fits all. Being a hardliner with star players often works to get the best from them; however, demanding perfection and accepting nothing less from young developing players does not seem to work very well. The more afraid you are to make a mistake, the more mistakes you make. At this point, at least from an outsider’s perspective, the level of scrutiny used on developing players in Chicago seems far more sharply focused than that used on the established players. This season, Chicago was able to go out and get the polished professionals the team felt they needed to ice their best lineup without Patrick Kane. The question is, how long will they be able to do this as the veteran core of the team ages? The way Chicago develops young talent will need to be adjusted soon if the team wants to avoid the lulls in the cycle of success. Personally, I hope that Quenneville is willing to adapt his approach a bit, because he is obviously a tremendous coach and as a fan, I want the team to continue to be successful. Will that happen? We’ll see. This article will be followed shortly by another post detailing Chicago’s player development and usage over the years.